Mary Walshok '64 describes Torrey Pines Mesa as a scientific sanctuary designed to encourage creatvity and reflection. As the 1950s came to an end, Jonas Salk was looking to open a top-flight research center. The man who developed the polio vaccine wanted a site where scientists would be inspired by their surroundings. Today, standing at the Salk Institute for Biological Studies, you can see what a perfect spot he picked. Sitting atop a rocky cliff in La Jolla, the world-renowned facility looks out prominently on the Pacific Ocean, offering a scenic vista that’s as dazzling as any in San Diego. On this mid-January day, the sun is out, the surf is glimmering and two hikers are walking leisurely along the canyon trails below. The open, airy design of the institute accentuates the calm of the horizon. A sociology professor and sought-after expert on San Diego’s economy, Walshok is my personal guide on a tour of Torrey Pines Mesa, a high-wattage biotech cluster that stretches about three miles along the La Jolla bluffs. She knows just about everything about the area, from the history of city land deals to where the eucalyptus trees on the hillsides come from, and her earthy enthusiasm and humor enliven the journey. As Walshok explains in a new book she has co-authored, Invention & Reinvention: The Evolution of San Diego’s Innovation Economy, Torrey Pines Mesa has been a catalyst for the region’s prosperity in recent decades, as the city has refashioned itself from a military metropolis to a thriving hub of science and technology innovation. The mesa is home to such heavyweights as the Scripps Institution of Oceanography, Qualcomm, General Atomics, the Scripps Research Institute, and the new star on the block, the J. Craig Venter Institute. Walshok proudly notes that Pomona’s Roger Revelle ’29—a UC San Diego pioneer and onetime director of the Scripps Institution of Oceanography— played a pivotal role in the emergence of Torrey Pines Mesa in the ’50s and ’60s. The Salk Institute, founded in 1960, is largely regarded as the most iconic of the mesa’s inhabitants. 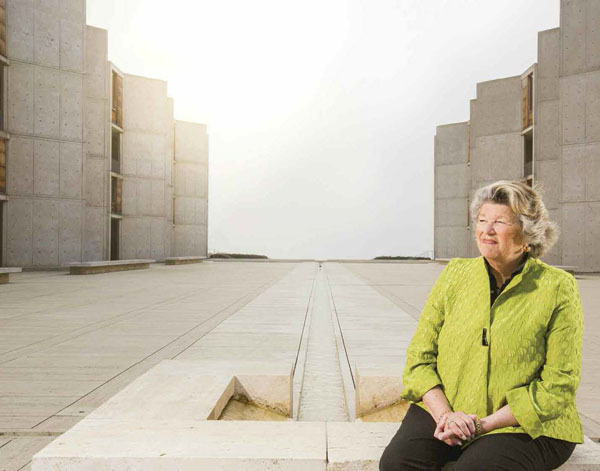 It was designed by famed architect Louis Kahn, who deftly captured Salk’s vision of a transcendent place for thought and discovery. At the center of the site is a courtyard separating two uniquely shaped, symmetric structures— six-story laboratory buildings with dramatic views of the ocean. A narrow channel of water flows through the middle of the courtyard. The place gives off the vibe of a scientific sanctuary, encouraging creativity and reflection. The inviting look embodies the architectural character of many of the spacious centers in this biotech cluster, says Walshok. The idea is to create public spaces that are welcoming and open, integrating nature and science and art. These are not labs where researchers work in darkened isolation; rather, the science campuses are popular sites for public receptions and concerts, Walshok says. Down the road, at the Scripps Research Institute, a courtyard features a row of bamboo trees, a large open space and a concert hall that’s one of the best in San Diego, Walshok says. Nearby, UCSD houses the acclaimed La Jolla Playhouse, and across the street from that is the new bluff-top campus of the J. Craig Venter Institute. The $37- million, 45,000-square-foot structure officially opened in November, although parts of it are still being completed. Venter is the La Jolla biologist who cracked the human genetic code, putting him on a bevy of magazine covers. As Walshok and I walk around the place, we look out at the ocean and the eucalyptus groves in the canyon below. The Venter Institute looks clean and contemporary, evoking an elegant, techno feel; its design features an open courtyard and lots of glass, wood and concrete.